Please note: all the little thumbnails can be clicked for a bigger view, i just did it this way so the whole page would load faster, gonna be lots of pics..
its about 7 feet long, maybe 16 inches or so wide at its narrowest point, and two and a half inches thick. I got two of these for $110 from a guy who mills fallen trees he finds. Because he doesnt chop the trees down Im more than happy to buy the stuff. 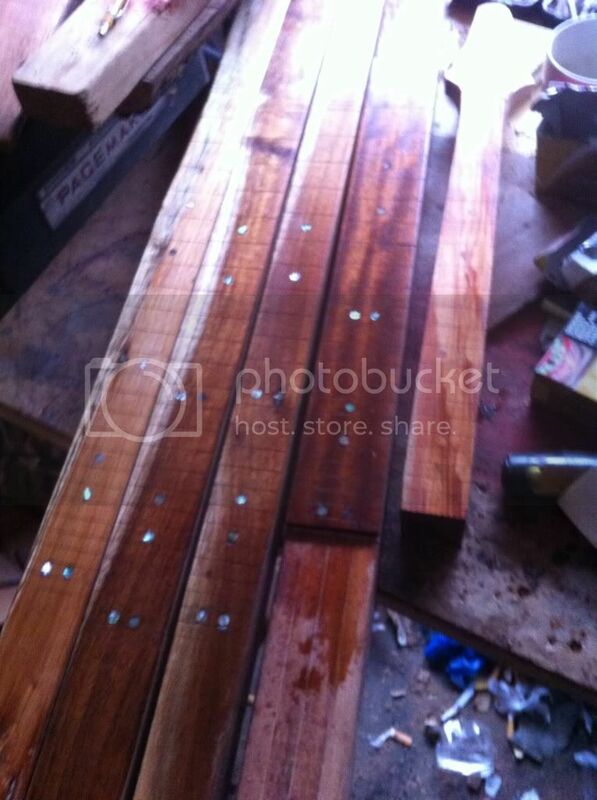 which is recycled merbau decking laminated with tas oak veneer. this is for an extended range 7 stringer, the one piece necks will be four pair jobbies. One of them is for my good buddy Harrison Withers, so hopefully he'll chime in at some point and say 'i want that one'.. making an axe for harri is kinda intimidating incidentally, cos he's got one off just about everybody, theres probably more gitts at his place from members of this community than anywhere else on the planet. Ill be doing my best to remember to document everything so you can see some of my tricks and mistakes too. Ill also try to stick to a batch mentaility as long as i can, although i generally cant avoid taking one and just running with it at some point. it always happens. ok been a couple days..
got the laminates out of clamps, ripped each up the middle so now i got two neck blanks from each. broke the blackwood into four body blanks, I was kinda hoping for five bummer..
put the Qld walnut neck blacks back on the shelf, Ill be doing three one piece Blackwood ones and one of the laminated ones with these four. Ok so I got four of em slotted and drilled for dots. Ill be giving my usual cheapskate twig dots a break and doing abalone, these blackwood necks are kinda special, and ones going to Harrison, a guy with many many guitars, so a few 40c dots wont hurt..
for placing the dots i rule a line from one corner to the other, dead simple..
pretty much had the weekend off, had my daughters birthday etc..
took the widest of the necks that I had slotted and dotted above, the merbau / merbau one, and decided to make it a 6 string cbg.. well an hour here an hour there and thats just about done, but while waiting on glue today i had a little guilty pang about jabes there waiting on help for neck slots, so time to get back to the main event..
up until this year i had only ever done one size of bolt in neck slot, standard Fender size. thats pretty easy, because you have a jig to follow, basically a rectangle the exact right size, and you can tape or clamp it down and just follow that with the router.. well this year Ive done everything but standard, and every necks a different dimension, so I need a jig with some adjustment. There would definitely be better ways to do this, this is just my quick way of doing it, but it hasnt let me down yet in 8 neck slots so far this year. we start with two planks, nice and square and of identical thickness. I used the sides of a crusty old drawer I found. we also need one more bit of scrap, nice and square and around 7mm thick, maybe 1/4".. I used a bit of fingerboard trimming.. I put the neck on the plank where i want it and trace around the end with a pencil. 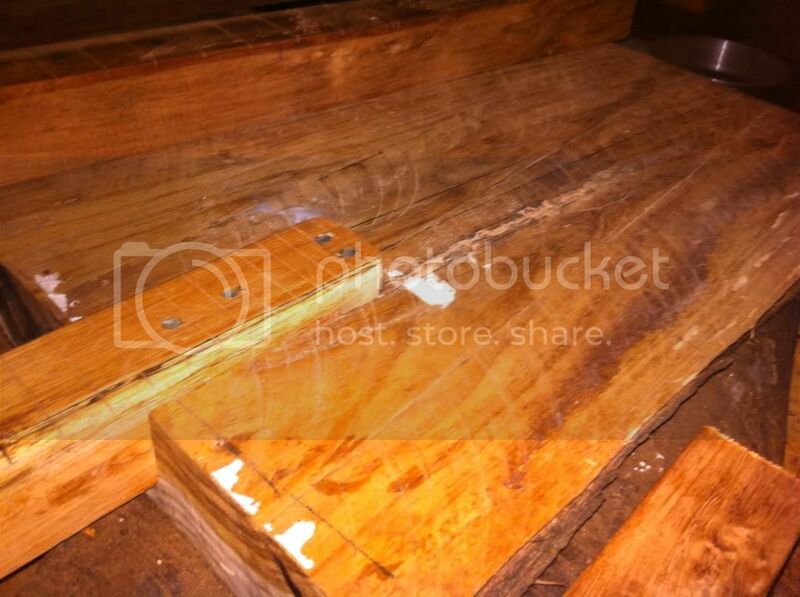 the fingerboard scrap piece is double-side taped down on the plank to mark the end of the slot. by pushing down real hard i get the double-side tape to stick quite well. From here on out, where Im using double side tape, please take it as read that ive applied a nice bit of pressure on it, leaning my body weight on it. the first drawer side goes down, and I drop a few screws through into the body where it wont matter because the cutaway will remove the holes. make sure that the screws go right in countersunk so you dont impede the router..
the other side of the slot is prepare with the double tape.. I use the neck to help me line up the second drawer side, but theres a trick, you lift the neck and nudge the drawer side in a pinch before you stick it down, so the neck wont actually fit..
its kinda fiddly and takes a couple minutes, but its worth the effort for a nice snug join. this is the router bit i used, just about my favourite bit. it has a big bearing above the cutter, perfect for following a template from above..
when you're routing like this you have to be careful not to cut into your guides. the bearing needs to run up to the drawer sides and fingerboard scrap but the carbide edges mustn't touch them. so you need to go in to the right depth before you clean up the sides. Take it easy with the router, if you only take a few mm with each bite you'll get a nice clean cut. ALWAYS GO CLOCKWISE. and ALWAYS ALWAYS ALWAYS KEEP BOTH HANDS ON THE ROUTER. clamp your work down, never ever ever have one hand on the work and one on the router. ok lecture over, sorry.. I dont wanna encourage anybody to lose a finger or two..
pulled the jig off, and its a real snug fit. Because im doing a few at once i pair the neck and body by marking with a number. ok so I did two like this, one for me and one for harri. it took a fair bit of effort, but I managed to push the neck into its slot in my one for a pic, illustrates the neck angle. Harrisons one is an even tighter fit, no way its going in without a few shavings from the chisel, but i'll leave it until the neck is finished and sanded etc. next.. designing some bodies :)..
then mark in the approximate bridge location. the center of the bridge is the center of the tone well, so I knocked up a little circle cutting jig and anchored it there. got a bit of bug eaten barky edge up top, think I like it..
well I said I'd catch Harri's one up, so got the tonewell dug out and started on cutting out a rough shape..
made a start on the shape but im unsure how im going to do the enlarged upper cutaway.. plan is for an array of sympathy strings, a zither with tuners up here..
gave that a break and got some planing / sanding done on my one, rubbed a little tung oil in for this pic although again its only rough sanded, and a lot of it with the disc sander, so its all those curved lines on it..
the worm eaten edges are particularly cool, and im very pleased how well the spalty neck matches it.. This veneer is already bookmatched on the roll, nice..
Then flipped it over and made the chamber (avoiding the control cavities) also drilled out for the pots and switches with a forstner bit, although the depth is not final because there will be a fair bit of carving from the top still. You can see that eventually I cut right through into the conewell that we made earlier from the top, this is important to join these cavities to create a larger volume of air to sing. Made a good start on that..
Then prepared the back by signing so it'll be visible through the soundhole..
Out of the clamps, trimmed the back down using the bandsaw and sanders, wary that a flush trimming with the router might tear out bits of the veneer. Been making little refinements to the body for the other one, it's a little dr Seuss because of the wood I need for the zither tuners up there. Hopefully with a lot of hollowing out and carving it'll become something guitarish. YOu may have noticed that I flipped this blank over right at the start for the neck slot compared to the other, so this will feature the white sapwood much more than the other on the face, which is predominantly the chocolate heartwood. Unfortunately a lot of that checking is quite deep and will not sand out completely, although some will. It'll still be real nice Harrison don't stress. This happens from the wood shifting as it dries, this is quite a knotty piece with a couple branches coming off the tree right here. With the body shape on the first one pretty much finalized we can finally return our attention to the neck. I needed the neck started to make the slot, but the taper and profile is better left til now so that it meets the body perfectly and is still square at the portion which sits inside the slot in the body. Ok. So with that done the neck can be pushed into its final position. I do that and pencil around the join (onto the neck) on both sides and the bottom, the taper and profiling cannot go beyond these lines or they'll sloppy up the neck to body join. On the other hand I want as little heel and as neat a taper as possible, so they want to come right up to these lines but not beyond. Before I taper or profile I route the tuner slot. While the sides are square the rouer can easily follow the sides.. By tuning the router around without moving the edge guide I can get the slot equidistant from each edge. I have done many of these violin style heads.. Usually I taper this route, so it's narrower at the end than at its start, and then follow the taper with the outsides of the head. Although it looks great and more like a violin head it's not really suited to geared guitar tuners.. Because they will push their string posts in at 90 degrees the top and bottom tuners wind up at weird angles to each other which can lead to tuning instabilities especially if you did any kind of whammy bar or benders. Anyway in this neck I elected to sacrifice the style for function and keep it all square, more like a typical dulcimer head. When carving three dimensional objects I find it helpful to push one of those dimensions aside and only work with two at a time. I elected to do the profiling first because that provides the most usable bit of scrap for pickup bobbins, tailpieces and bridges etc. Ok so pencilled the profile in for the neck and for the head, leaving a nice volute in between. And the truth is guys, it don't take much at all. On this neck I'm taking 3mm from each side at the nut. I take out that 3mm from each side first with the end of the belt sander, just as in the pic above. I love the end of the belt there, one of my fav tools. (incidentally, I keep very coarse paper on the disc sander, 60grit, but finer 100grit on the belt. The disc is my 'fast removal of material' machine. Once those notches are out the disc sander makes the tapers to the line in seconds. Once the taper is in I can put in the side dots, 4mm green abalone, again from eBay. Simple really, run the drill in reverse as before. Where you have two in close proximity, at fret 12 and particularly at 24 if you go that far its sensible to do the pair one at a time, otherwise you can easily tear out the small amount of material in between the two holes with the drill. I used cheap dollar store epoxy for the abalone. Got that rounded over and started to think about the scroll..
Well I thought about it a little and decided I didn't want an elaborate carving on this head. I really like the way the spaltiness starts up here, and I wanted to focus on the natural beauty of the wood. So I just rounded it off. Sanded for around an hour with 60grit then a few minutes with 120.. Tomorrow, frets, then some pickups. I have a little of mr gittys gold fretwire and I'm very tempted to try it out tomorrow, I'll probably never have such a nice one piece neck again..
Making it from scrap from the neck so it'll follow on thru. A single fret slot, and a bunch of holes..
Wonder where the other half of the cigarette went?. Need a nice fat single coil for the neck position and another for the inside. The interior one will not be visible and does not need more than one pole piece. Although I only need one, I'll be needing two for the other guitar so I'm doing three of these today. The bobbins for these are made from a cigarette packet. I'll often make pickups from scrap cardboard if they're to be hidden, it's much easier to work with cos it's flexible. I recommend it to anyone wanting to get started winding pickups, they can easily be covered in veneer, wrapped in cookie tin bits or stuffed in a mints tin etc etc.. Gluing them up on the steel table of my bandsaw. Used hot glue cos it's so cheap. It doesn't stick to the super smooth coating on the rare earth magnets very well at all, but it sticks on the cardboard, so I basically surround the magnet with glue and stick the top on before the glue cools. Also painter the coverplate tan with some metal primer paint that I found in the shed, just happened to be there, I think the colour works well. Made a little riser for the pickup from the same bit of scrap, the chocolate had run out, but managed to mirror the spalt lines. This riser means I need to take another little notch from the neck. while I had the little drum sander on the dremel, one of the last touches on the neck, carving away for the nut into the tuning slot so the outer strings don't foul on the wood. Drew up my circuit (as it will appear from behind, ie thru the control covers when soldering..) on some little sketch app on the iPad..
Have a goat hide and half a kangaroo hide from my banjo trip a couple years back. Not a lot of time before dark tonight, big and difficult day at work..
Just turned a few knobs. I've tried wooden knobs from scrap a lot, and I find they work loose o er time and fall off. Sometime ago I tried them with sticks, drilling into the center of the growth rings, and I find the radial nature of the grain (as opposed to the linear grain I'd have from a bit of bandsaw scrap) really helps the knobs get a good grip on the pot which actually gets tighter not looser over time ;) they also take stains in a really interesting way, particularly if there was a branch or two coming off right there (knots) which are the bits I like to target from my knobs..
wow Jef thats some real pretty wood you got there...yeah guess i`d best get started on my first solid body build myself. I`ll take a look in my slab pile for something nice...i`ll be hittin you up for added info as the build progresses..
thanks Jef ,i see now why you route the body blank to the neck first . If you mess up at least you haven't done all that work on the body first,and also the grain of the wood can in some ways design the body shape i guess. Well anyway ,yesterday i chopped out the slot with a couple of chisels and got a nice tight fit with the neck and angle, it 's looking pretty good so far, although a bit predictable as far as the body shape. Now to cut the headstock shape,this is the first time i ever added 'ears' . naw mate, looking good !! whats the plan here? 3, 4 strings? we'll see my little jig for testing filters (cap, resistor values etc) towards the end. It really depends on the pickup.. I've been really slack with this blog, sorry guys, it got tedious. this all seems to have stopped dead- everything ok over there???? Ill be getting into Harrison's one soon maybe then..